We live in a time where application development has a major role in every aspect of business --so it is crucial that every company be able to adapt to advances in RAD technology. It is no secret that the playing field for application development and delivery is one that is constantly evolving, as the needs of digital business are also forced to rapidly adapt to changing customer needs. Continuous delivery is key among the forces driving modern development, which is one of the reasons why low-code and no-code development have risen in popularity as solutions over the last few years: It allows faster iteration and faster delivery to customers. Professional developers cite a number of problem areas in the landscape of application development. These include the difficulty of meeting business requirements on time, lack of flexibility, slow updates for applications, high costs and low budgets, and a lack of qualified developers. But given the constantly evolving nature of application development, what comes after low-code? This is where high productivity no-code application development platforms like Betty Blocks come in. The next generation of application development, no-code, provides the tools to innovate fast and flexibly. Developing enterprise applications through traditional coding is time intensive and difficult. It requires professional developers who have spent years honing their craft and becoming experts in multiple coding languages. As the name suggests, no-code application development indeed bypasses the coding process entirely. Using drag-and-drop visual modeling, it is possible to build entire functional applications without having to write a single line of code. Without the need to write and align each string of code perfectly, it is easy to adjust and update no-code applications. 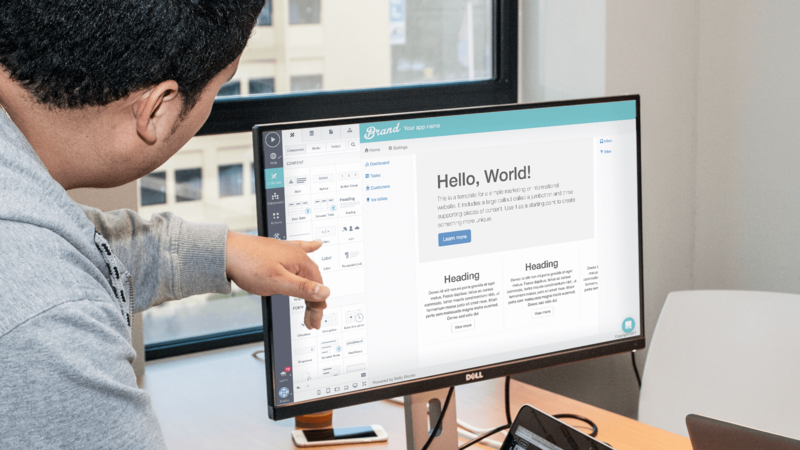 Because of the drag-and-drop interface, a few clicks are all it takes to develop prototypes, conduct user tests, and make changes as needed. No-code is showing the rise of a new type of developer in the application development scene: the citizen developer. Because of the ease of use of no-code platforms, business developers and other non-programmer roles are able to step in to meet the demand for faster application delivery. No-code actually helps IT departments run more smoothly, because it allows the business to reserve the precious resources that are skilled developers for the more advanced technical areas where their talents are truly needed (think security and system upgrades). So why is all of this important, and what does it mean for you? Regardless of industry, every company is in the IT solutions business. Whether you directly provide technology as a service, apps are involved in every aspect of your business. No-code presents a solution that is accessible to business developers and other professionals alike, and not just programmers or other techies. Want to learn more about how no-code is the future of application development in the age of digital business? Join us on April 20th for Betty Blocks on Stage. You won’t want to miss it, so reserve your free spot today!